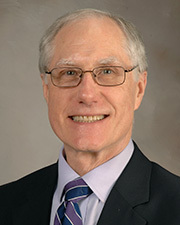 Dr. H. Vernon Anderson is a Professor at McGovern Medical School at The University of Texas Health Science Center at Houston (UTHealth). Dr. Anderson began his career as an electrical engineer, but quickly migrated into medicine and cardiology, and ultimately to interventional cardiology. Board certified in Internal Medicine, Cardiovascular Disease, and Interventional Cardiology, he is a researcher, teacher, and clinician in the Division of Cardiovascular Medicine. His current research interests include reperfusion in acute myocardial infarction, antiplatelet and antithrombin therapies in acute coronary syndromes, and quality of care and evidence based medicine in coronary artery disease. In addition to his clinical leadership, Dr. Anderson is active with the American Heart Association, the American College of Cardiology and the Society for Cardiac Angiography and Interventions. He has served and continues to serve on numerous committees, work groups and task forces. Dr. Anderson is a recognized expert in the treatment of acute coronary syndromes. He has lectured internationally on myriad interventional cardiology topics. He served for 11 years as an Associate Editor for Circulation (1993-2004), the premier scientific journal of the American Heart Association. Currently, he serves on the editorial boards of The Journal of the American College of Cardiology and The Journal of Invasive Cardiology. This past year Dr. Anderson was voted Teacher of the Year by the cardiology fellows. He is a fellow of the Society of Cardiac Angiography Interventions, the American Heart Association, the Council on Clinical Cardiology, the American College of Cardiology, and the American Medical Association.